Side leg zips can also be used for venting when needed. Berghaus says:"Waterproof over trousers in Berghaus' own Aquafoil® waterproof, breathable fabric; provides durable waterproof protection; ideal for year round use"
I've worn the Berghaus Deluge Waterproof Trousers for Men (in combination with the Berghaus RG1 Waterproof Jacket for Men) during walks in the Snowdonia and the Clwydian Hills during the Autumn months. The weather during these trips has been predominantly showery and damp. The fabric is not Gore-Tex but Berghaus' own Aquafoil technology which is great for keeping the rain and weather out - but not so good at letting your own moisture (i.e. sweat) out. Fortunately, with the Berghaus Deluge Waterproof Over Trousers this doesn't matter much. There is a full length zip on each leg that reaches to the mid-thigh. These have the dual purpose of allowing the trousers to be easily put on and off over bulky walking boots while providing ample ventilation and venting when the going gets tough. Whilst the zips themselves could be more robust, they do have poppered storm flaps to keep out much more of the weather than just waterproof zips alone. The waist is elasticated with an easy to use draw cord that can even be adjusted with gloved hands. There aren't any pockets, but the leg zips are just about high enough to enable you to access pockets in your under-trousers without having to go via the waistband. The material is a bit a noisy & crackly but it is reassuringly robust. I spent plenty of time climbing stiles and wading knee high through vegetation and the fabric appears to be perfectly durable. Having said that, there is no reinforcement in the seat, the knees or at the base of the trousers so this might limit their durability if you spend a lot of time scrambling or tramping through the snow in crampons. There is no stow sack (who needs it anyway - it's just more weight right?) 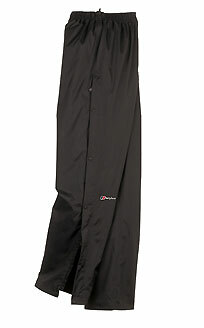 and the trouser bottoms have no ankle cuffs - but for a pair of lightweight, easy-to-carry, water-proof trousers with plenty of venting and access to your pockets - the Berghaus Deluge Waterproof Trousers for Men at £40.00 or less are an absolute steal.